International Child’s Day for 2018 was marked at Schneider Children’s under the slogan "See Me"
International Child’s Day for 2018 was marked at Schneider Children’s by the Committee for the Protection of the Child under the slogan "See Me". The objective of the "See Me" slogan was to raise awareness and sharpen instincts in identifying children in distress or under duress. 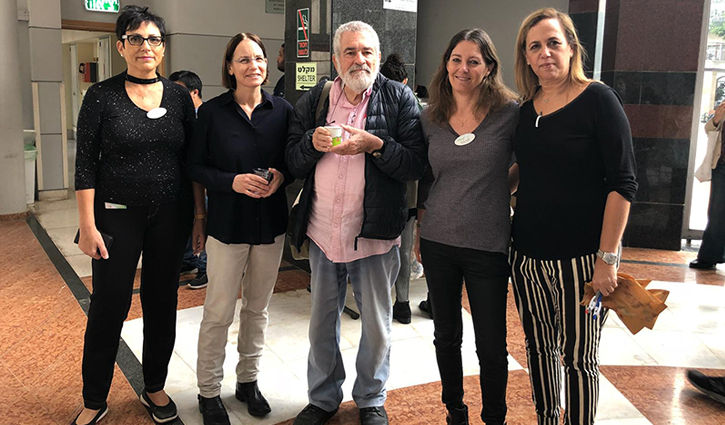 As part of the event, renowned children's book author, Yehuda Atlas, gave a presentation entitled "And This Child is a Child at Risk" and read excerpts from poems he wrote based upon his stories about adults who suffered abuse and neglect in their childhood. Among the activities that took place in the hospital's atrium was a magnet photography booth for parents and children to underscore the importance of awareness and responsibility for children's welfare. Parents were given pointers for proper listening and children received brochures entitled “Chamudi (lit. Cutie) for the Child’s Well-Being”, which included an explanation about avoiding risk situations and when to share information with adults. In addition, guidance sheets were distributed about the prevention of accidents in the home, vehicle safety for children, falls prevention, age-appropriate foods and the danger of shaking infants. The Committee for the Protection of the Child at Schneider Children’s provides counseling and guidance to staff concerning children arriving for treatment where there is suspicion of abuse or neglect, and also aims to raise awareness and instruct hospital staff about these issues. Members of the Committee include Chair, Dr. Rama Schwartz; senior physician in the ER; committee coordinator and social worker in the Institute of Endocrinology and Diabetes, Efrat Harel; Deganit Ben Nissan, chief psychologist in the Institute of Child Development; and Idit Ronen, a member of the hospital’s Nursing Management.